In case you think the social panic leading to Brexit is new, here’s the story of an earlier one that had grave consequences. In the months before war broke out in 1914, the United Kingdom underwent a social panic. People started imagining that British towns and villages were hotbeds of German spies. At that time our relationship with German was good; a great many Germans studied at British universities and worked in the UK. But fiction always needs a villain, and books were filled with the sinister Hun invading the shires and sending back secrets to Berlin. One such book, ‘The Invasion of 1910’, became a smash bestseller. It was by William Le Queux, one of the country’s highest-paid pulp writers. He had written fiction about Britain’s lack of preparation should there be a war, and his book touched a nerve. It was translated into 27 languages. Lord Northcliffe, the owner of the Daily Mail, serialised it, and persuaded Le Queux to have his fictional German villains pass through every major town where Daily Mail sales were high. He sent out sandwich-men to advertise the Daily Mail and dressed as German soldiers, parading them through London – the sight of seeing war veterans shamefully dressed in the uniforms of their old enemy upset many. Le Queux stoked the fires of suspicion by now writing about a civilian army of German spies disguised as everyday members of the public. He insisted that they recognised each other by a peculiar-shaped pin in their lapel. Soon, fantasy and the truth were completely blurred together; MPs started campaigns to hunt down traitors, and a new Official Secrets Act was rushed through parliament when almost nobody was sitting. A register of aliens was created, and other books and newspapers now threw petrol on the flames, searching for hotbeds of enemy agents in quiet country towns. The fervour whipped up out of nothing had taken on a life of its own. By 1914 it became the subject on everyone’s lips, and politicians feared it had damaged Anglo-German relations. Of course, the starting gun for the war was ‘the shot heard around the world’, from assassin Gavrilo Princep’s Browning revolver in Sarajevo. 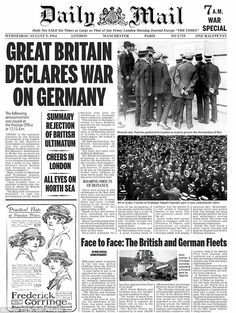 But the UK had already been prepared for war by the foreigner-hating Daily Mail. Browning revolver? Oh dearie, dearie me, Christopher. I expected better technical expertise from you. It was a Browning semi-automatic pistol. These load from a magazine, while revolvers hold bullets in a cylinder. Anglo-German relations had been turning sour from well before 1910. 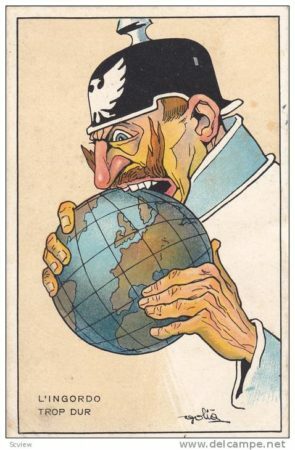 It began with the arrival of Kaiser Wilhelm II in 1888 with his expansionist policies, generalized loudmouth manner, and failure to appreciate the ‘land rat-sea rat’ boundary set out by Bismarck, whom he dismissed in 1890. Was Kaiser Bill the Donald Trump of his day? The Anglo-German arms race followed. Notably, the Royal Navy initiated the development and design of the Dreadnought class battleships around 1904. Though there was certainly a tinder box waiting for a spark, from things my grandfather said, many (reasoning) people in the UK had severe doubts about why we should have gone to war. Undoubtedly, that bastion of intelligent thought, the DM, would have thrown fuel on the fire and fanned the flames with all its patriotic enthusiasm. I may be something of a cynic, but my limited knowledge of history and personal observation of recent decades suggest to me that many policy decisions by many politicians, media proprietors and opinion makers are motivated by one or all of: making money for themselves and their friends, gaining and maintaining power, winning fame and writing their names in the history books. The costs to other people, poverty and even the deaths of thousands, are of little or no consequence. Certainly armaments manufacturers did well out of the pre-WWI arms race. Dreadnought type ships became national status symbols across the world, though the views amongst naval hierarchy were mixed as they were incredibly expensive to build and operate. That may be why only one example remains and that’s the battleship Texas (possibly the US versions were a little more compact). It is (or used to be) moored in the Houston Ship Canal near the San Jacinto Memorial. It’s better to visit the ship when the weather is less hot and humid. San Jacinto is also a remarkable piece of war history. William Randolph Hearst is said to have “created” the Spanish-American War. “You furnish the pictures and I’ll furnish the war.”.he told a photographer. Anglo-German hostility began long before 1910, as Peter Tromans said. The Riddle of the Sands, featuring a secret invasion, was published in 1902 and Saki’s When William Came, about a German-occupied London, are both still in print, and .there were so many more books that Wodehouse wrote a parody of the German invasion books, The Swoop. WWI was waiting to happen, though. It came close several times before 1914 – the Agadir crisis and the Fashoda Incident, for example. The Daily Mail has always been the paper that reflected the worst prejudices of the middle and upper middle classes as it does today it is written by and for people full of hate. That said the Germany of 1914 has to be blamed for starting the war along with the Austro-Hungarian Empire Kaiser Wilhelm ll was as bad as Hitler and should have been executed as a war criminal. Undoubtedly mistakes of massive proportions were made by other countries just imagine what would have happened if Nicholas ll had not mobilised his army and kept out of the war. It is a source of constant amazement to me that these countries that were mostly ruled by related royals could not stop this insane war. I thought one of the factors which brought about WW1 was Germany having a later industrial revolution than the UK and therefore being capable of out manufacturing us and also organizing a more efficient distribution of their goods. Classic Marxist theory of history everything is down to economics. The UK had its nose put out of joint by Germany’s success. Were there not a few “paranoia” volumes prior to Riddle of The Sands? Starting in late 1880s? Bloody hell Peter Tromans that was all excellent stuff. Ah, the 1910 Dreadnought Hoax, starring, among other Bloomsberries, the august Virginia Woolf. Spoof as art. Middle class misapprehension derided. Bunga, bunga. Of course the roots of WWI are more complex – the Mail was in fact pushing an agenda of neutrality for a while – but as an example of a social panic it’s interesting. There was a strong ‘anti-foreigner’ feeling at home, reflected in fiction and non-fiction of the time, but the Mail chose to help create fear, not quell it. As always. Considering the necessity for a vaguely democratic government to carry a significant fraction of public opinion with them when entering a major war (or a major Brexit), the DM effect might have a bigger consequence on the final decision than we’d expect or want. Fear of the other is always the refuge of weak leaders at home. Whether wars of Medieval kings or financial backers of politicians today. Now it’s Iran that’s the target of trump and his media backers. I hope Britain can pull back from the Brexit fiasco. And that November 6 elections in the U.S. put a break on trumpismo. Er…Not a Browning, but a Belgian FN 1910, rip off of the Colt Automatic. “The sight of war veterans shamefully dressed in their old enemy’s uniforms” Um, which war was that? The French had recently fought the Germans (they’ve had three goes) but not Britain, I thought. What did I miss?